Born in New York City, Corbisiero represented England at age grade and Saxons levels before being handed his Test debut against Italy in the 2011 Six Nations. Boasting the physique of a contemporary prop, he was introduced to the game at the age of five by his American father. Before joining London Irish in 2005, he played for KCS Old Boys, London Scottish, Cobham and London Welsh and has also since appeared for Nottingham. Corbisiero experienced the sharp end of the sport early in his career, coming off the bench as the Exiles lost out to Leicester Tigers in the Premiership final, but he quickly made ground to force a Saxons call-up and eventually a shot at Test rugby. 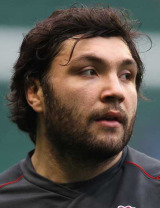 After deputising for the injured Andrew Sheridan during the 2011 Six Nations, Corbisiero won a call-up to the England squad for the Rugby World Cup. Playing a bit-part role, the loose-head remained a strong performer and kicked on under the guidance of coach Stuart Lancaster in the following Six Nations. He toured South Africa in the summer of 2012 and featured in England's historic win against New Zealand at the end of that year but a chronic knee injury would wreck his Six Nations hopes and appeared to rule him out of the British & Irish Lions tour to Australia. But having regained his fitness he was selected for England's tour of Argentina before being called up by the Lions as cover for Ireland prop Cian Healy. His strong form on tour saw him catapulted into the test team for the opening game against the Wallabies. A calf injury ruled him out of the second test but, after a remarkable recovery, he returned to the starting line-up for the final test when he scored a try and decimated Australia in the scrum to help the Lions to victory.